The history of my family is the story of people who were divided by distance or religion. The fate brought them together for a long and happy family life. And this is very much like people on TAU2 who are looking for their better half, except in the past there was no such excellent opportunity as using dating sites. To me, my family means first of all my parents. My mother was a real Cossack girl from the Don river, one of those who were so skillfully described by Mikhail Sholokhov (a Nobel Prize winner) in his novel ‘And Quiet Flows the Don’. My father was from a family of Ukranian tanners, he came to the Don because of the great famine in the Ukraine in 1930’s. They had three children: myself, my sister and my brother. When I was a child, my grandmother Feodosiya also lived with us, she often told us about our great grandmother and great grandfather. Her stories were also full of warmth, jokes and humour even though their lives were not easy. At the end of the 19th century, my great grandfather Nikolay had everything one could wish for. He was a Cossack, had a house, cattle, a big plot of land and was the father of five children. But his wife died while giving birth to their fifth child. At the funeral Nikolay got drunk, went outside, fell into a snowdrift and got frostbite, so that both his feet had to be amputated. The relatives and neighbours got tired of helping the big family and decided to find him a wife who would run the house. There was this young girl Sofia, whose father Moisei (a Jew who was the watchmaker of the village) died recently. And they all decided that Sofia should forget her Jewish roots, convert to Christianity and live like a proper Cossack girl. She was baptised and brought to Nikolay’s house. The hungry children crowded around her and she rushed to the stove to cook something for them. Her cooking was very unusual but very tasty. Sofia became a good mother to the five children. People were saying that such a stepmother is better than some real mothers. In a year, in 1892, she bore a girl who was named Feodosia (Feo or Fenya for short) and who became my grandmother, the mother of my mother Nina. Sofia had no other children. Feodosiya had dark curly hair and a pretty milk-white face with clear sky blue eyes, just like her father’s. She had angelic looks but a very mischievous character. I am very much like my mother and my grandmother in everything, both in looks and in character. I may be naïve in some things, but I’m always determined. Though, if one looks closer, I look like my father as well. It’s true that every person loves himself or herself and looks for the better half that is similar. Having graduated from the military school in St. Petersburg, my grandfather Mikhail met the lively girl Feo at one of the parties (that was the way young people met before TAU2 was invented) and fell in love with her. 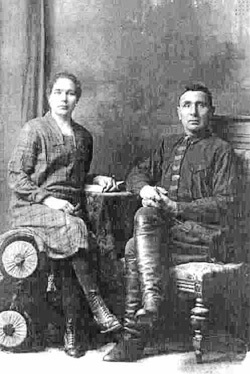 They got married in 1910 and he was sent to serve in Ekaterinburg. They were given a house with a big plot of land, though not in the town itself, but in a village nearby where gold diggers lived. Cossacks were not allowed to dig for gold, but Feo was never the one to abide by the rules. Despite being almost permanently pregnant and nursing babies at the same time and against her husband’s orders, she got the necessary utensils and got to work. In the darkness of the night she dug hole after hole on their plot of land and covered them with wooden boards and tree branches for the day. She got lucky, and in two years she had panned quite a bit of gold. When they returned home, they sold the gold and bought a good house. My mother Nina was born there, in the Urals, in 1913, she was one of five children. My family seemed to come right out of the Mark The Rich Man tale which my grandmother Feo used to tell us. Like any Christmas story, this tale had a sad beginning but a happy ending. Grandma wove the elements of all the Russian folk tales she knew into this story. We, the children, always listened to her with bated breath. Good always won the struggle against Evil, orphans found a family, hungry people were fed, freezing people were warmed up, sick people were cured and rich people were generous to those who were less fortunate. This tale has given me my role models for the rest of my life and taught me how people should be treated. I learned to be a good host by watching my parents who always liked to invite people to our house even during the hard times — during the war and just after the war. They never got depressed, they had fun with their friends, sang songs and danced. When I started my own family, I treated my husband and our children (two daughters and a son) the way I learned it in my kind and happy family when I was a child. Sometimes I had 30 guests come to a party at our place. The revolution. Perestroika. The breakup of the Soviet Union… Unfortunately, Time takes away our loved ones… Now I live with my daughter Nina, who is the middle child. My son Dmitry lives separately from us, but also in Rostov. He is a specialist in managing big companies. Unfortunately, the past year was a difficult one for our family, my son’s marriage broke up. My older daughter Natalya has been living in Saint Louis, USA, for almost 20 years. In 1992 she applied to 50 best universities of the USA and Great Britain. She was invited to Harvard, then she studied at the Washington University and got her doctorate in Law, worked as a lawyer and taught at the university. She married an American of German decent. I am very proud of my children, even though all of them are going through a hard time now. What are my expectations on TAU2? Sometimes I think that it’s too late for me. It’s highly unlikely that I would meet a man with whom I could talk all night long like I used to talk with my late husband. But I have met some men on TAU2 whose interests are similar to my own, who want to write down their family history, like I have done. Now I want to publish my own book. My daughter Nina is also registered on TAU2. I want her very much to find her better half here. Whom am I proud of in my family? I’m proud of almost everyone, from my great grandfather and great grandmother to my children because all of my family members have found their own way in life, not an easy one, and based their family on loyalty, mutual honesty and sincerity. Lyubov, 60, Rostov-on-Don. Quiet, but passionate and sincere. Helps people, writes books, wrote down her family history. Любовь, какая вы умница!!! Вы сделали то, о чем я мечтаю эти 10 лет, но молчу, ношу в себе… У меня все мои предки жили хорошими семьями, все понимали друг друга, любили, помогали. Моему поколению, да и детям моим, с мужьями не повезло. К сожалению, пришлось столкнуться с изменой, предательством, коварством, но детей смогла вырастить и воспитать добрыми, трудолюбивыми… Сейчас две дочери замужем, живут в Германии (две внучки с ними), меньшая тоже живет отдельно, а я сама – тишина-покой, но хочется, чтобы рядом был родной человек… мужчина! Очень интересная история Вашей семьи и написана просто, читать-одно удовольствие.Обязательно напишите книгу. Думаю она будет иметь успех. Удачи Вам в жизни и творчестве. Я ценю ваше приглашение, чтобы прочитать их публикации в блоге Тау. Это было очень интересно узнать их происхождение и особенности принципов и ценностей, которые сформировались и присоединился к … что самое главное, братство, уважение сохранить семью. С наилучшими пожеланиями к Вам и к Нине.